Honeymoons are meant to be an escape and nowhere feels farther away from the daily routine than Krabi, Thailand. From the breathtaking views to the exceptional resorts, and pristine waters, it’s the ultimate exotic destination for honeymooners looking to really get away. We are giving you a quick download on this gorgeous honeymoon destination. 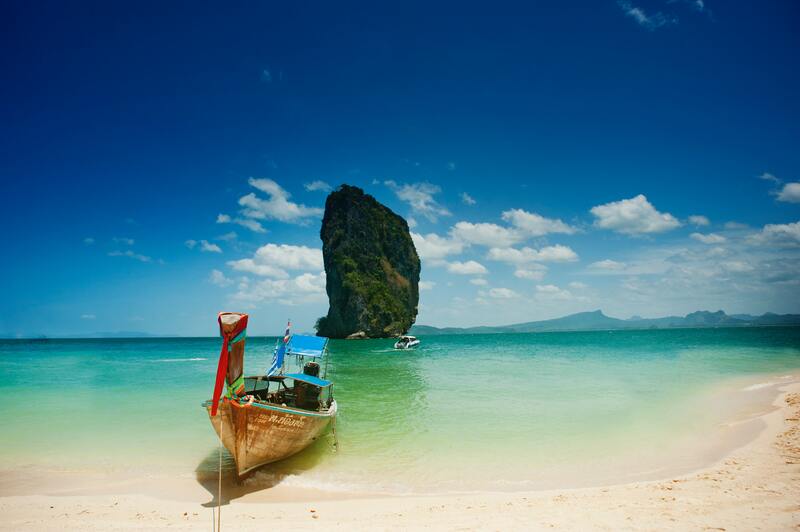 Krabi is located on the picturesque Andaman Sea, about 500 south of Bangkok. Krabi is still more of an up-and-coming tourist destination, so don’t be surprised by the dirt roads and major construction. There are many hotels and resorts in Krabi such as the as the Sheraton on a white sandy beach featuring water sports and a selection of restaurants. For the super luxe, check out Phulay Bay, A Ritz-Carlton Resort, for private villas in a sprawling estate with an insanely indulgent spa, a gorgeous infinity pool, and top-notch service. Take a long-tail boat! Go to Krabi Town and you can basically hail a boat like a taxi to take you to Phi Phi Island, Ao Nang, and Railay Beach. These are really popular excursions, so if you want to relax somewhere quieter you can also arrange for a larger boat to one of the many small, serene islands nearby like Bamboo Island. Of course, eat lots of Pad Thai and green papaya salad. High season is November to March. If possible, try to avoid Christmas/New Year’s week because it is the most crowded time in Krabi. There is actually a new international airport in Krabi and of course you can stop first in Bangkok. As much as you want to, don’t purchase any Buddha souvenirs. It’s illegal to bring them back home and you’ll get stopped at security.